I know I have been on a Red wine kick for the past few months. I have not been ignoring all of you white drinkers, Really! I have recently been berated for ignoring your needs by avoiding whites at all costs. Hopefully, this review will make up for my inaffection.This week, you should make an effort to find this delicious and inexpensive white. Beringer is a very large producer in California. They produce a wide spectrum of wines, from $10 to over $100. In my experience, their wines have always been a good value. The Alluvium is a blend of grapes....a White Meritage (Rhymes with heritage). This blend consists of Semillion, Sauvignon Blanc, Chardonnay and a bit of Viognier. All of these grapes are delicious on their own, but when blended by a craftsman, morph into something special. The Alluvium pours beautifully....rich almost viscous. The honeysuckle aroma from the Viognier wafts from the glass followed by pear, and citrus. Swirling the glass, the wine clings to the bowl forshadowing the viscocity and lush mouth feel. Peach and stone fruit, pear, vanilla; all linger with a long finish. Fabulous for a $15.00 wine. This will be a great summer wine. Light, delicious and easy to drink. This is a great wine for a lunch of fruit and brie and a loaf of fresh french bread. Most importantly, your friends and family will thing you spent $25 or more on this beauty. This wine got rave reviews in all of the wine publications. Most recently, WINE SPECTATOR made this their wine of the week. Scores on this wine were 90 points from Robert Parker and 92 Points from Wine Advocate. If you want to buy this by the case, you can get it cheaper by mailorder. It is as low as $11.99 by the case from WINEX in California. You pay no sales tax, and you still save $25 per case. Be sure to buy the 2006 vintage. Although this wine should last for a few years, it was produced to be consumed young. This wine should be widely available. I would recommend Schneiders in DC on Mass Avenue 202-543-9300 and in Virginia Total Wine and More www.totalwine.com Until next week, enjoy! Once a month I get together with a bunch of neighborhood wine cronies to play poker. We really do play poker, but the enjoyment comes from the camaraderie of neighborhood friends and a mutual love of wine. Each of us brings a bottle we want to share, or brag about. It is a great way to expose oneself to others tastes, and every once in a while, find a gem. I'll give credit for this weeks find to Scott Greenberg, aka: THE VINE GUY. He is the weekly wine writer for the D.C. Examiner. You don't read the Examiner? Shame on you! Some great information is published each week by Scott and his wife Cindy (The Vine GAL). I liked this recommendation from Scott because he truly loves the wine. Sometimes that may not be the case! This wine is concentrated, filled with red and black fruit and has the complexity that many wines in this price range do not. It also offers immediate gratification. The 2004 was deep purple and viscous. Black fruit, smoke and very tame tannins make this easy to quaff. The finish reveals a few layers. Black current, Boysenberry and other black fruits give this wine a long, silky finish. Buy this by the case for immediate consumption. Back up the truck....it is worth it! You should E-mail Scott@VINEGUY.com and ask to be placed on his weekly e-mail list. He will send you a PDF copy of the Examiner's weekly article and keep you abreast of the Washington DC wine scene. Labels: "Delicious Petite Syrah", "Petite Syrah Review", "Value Wine Review"
Goodness, I forget how much I enjoy Zinfandel. I opened a bottle last night after my daughter's school play to eat with a bowl of pasta. I went down to the cellar to look for a reasonable (Think Cheap) bottle of wine that would hold up to the spicy red sauce. This Edmeads fit the bill to a tee. The 2006 vintage is wonderful. Be sure to get 2006 instead of earlier vintages. It is vastly superior. Deep ruby color leads to the aroma of pepper and black/red fruit. This is a big, dense wine with great mouthfeel. It is full bodied filled with ripe black cherry and raspberry with balanced tannin. It is a super bottle of wine for the money, and a perfect foil to a rich tomato pasta. This wine can be found locally at Calvert Woodley for $16.99 a bottle. Calvert Woodley is located on 4339 Connecticut Ave, NW in Washington, D.C. 202-966-4400. They have a great newsletter, and it is worthwhile contacting them to be added to the list. Sometimes you have to cheat a little bit to find a wine that hits the spot. Sometimes you have to cheat ALOT to find a good wine at an attractive price. I have to give all credit to this find to Scott Greenberg, aka: THE VINE GUY. He is the weekly wine writer for the D.C. Examiner. You don't read the Examiner? Shame on you! Some great information is published each week by Scott and his wife Cindy (The Vine GAL). I liked this recommendation from Scott because he explained that this wine spends the first 21 days in contact with the grape skins. This process is similar to the process used by Italian wine makers that produce AMERONE, one of my favorite wines. This wine is concentrated, filled with red and black fruit and has the complexity that many wines in this price range do not. For $20 a bottle, it is MUCH cheaper then an Amerone, but satisfying to the palate and the wallet. You should E-mail Scott@VINEGUY.com and ask to be placed on his weekly e-mail list. He will send you a PDF copy of the Examiner's weekly article and keep you abreast of the Washington DC wine scene.Tell him Gerry Sent you! Great response to last week's wine! Many of you have become believers and made the trip to PA to purchase these wines. Keep the e-mails coming.... This week, I am revisiting the wines that were left by friends and family during Super Bowl. My friend Paul Richards ( A real life astronaut! ), brought this bottle of "The Ripper" for me to try. God knows, I love the names the Aussie's assign to these wines. When I read the label and found out the grapes were from a town called "Donneybrook", I had to give it a try. These grapes are grown on the West Coast of Australia, then shipped clear across the country to the east coast for pressing and bottling. This wine pours out dark red, typical of an Australian shiraz. The nose is fabulous, blackberry and dark fruit, with a bit of spice/pepper. The flavor, although not overly layered or complex, is wonderful. Blueberry, nutmeg and some oak are well balanced and pleasant. The label lists this as 14.4% alcohol. I was concerned there would be a burn on the finish. There was no obvious hint of the high alcohol....just smooth tannins and lots of fruit. Although the winery says this can be cellered for up to 5 years....I think you want to drink it over the next 2. The rich fruit in this wine, like so many other Aussie treats, is the key to enjoyment here. Why tempt fate....drink it with Steak, Lamb...or a good stinky cheese. Thanks to Paul for the wine....it was out of this world.... Until next week, enjoy! Whenever I review a wine in the $8-15 dollar price range I get at least 30 e-mails with comments and feedback. With the economy uncertain, it is certainly timely to find more reasonable wines to enjoy. I have been on the lookout for some great bargains that maintain high quality and overall value. The "Holy Grail", right? For the past few years I have been drinking an Australian Shiraz that is not very well known. Pennsylvania currently has this wine as a Chairman's Selection. Usually this retails for about $18. Even at full retail, this is a good value. At $11.99, there is no reason not to pick up a case. Although ready to drink now, it has enough structure to hold a few years. Once you taste it, I think it will be all gone in short order. The dark ruby color looks light for a 100% shiraz (Syrah). Blackberry and blueberry nose segues into charred oak and pepper. The oak can be attributed to the American oak barrels that this wine is aged in. It has a nice mouthfeel, dense, smooth and without harsh tannins. It does not have a long finish, but for $11.99, what can you expect? You can go on-line to order this wine, and have it shipped to the closest Pennsylvania wine shop to you. For me, I order a bunch with friends, and we all drive up to Gettysburg to pick it up. Worth the trip. Although I am not a football fan, I see the SUPER BOWL as an opportunity to get together with friends and enjoy a cocktail or bottle of wine. My friends very rarely come empty handed to my house. I found 7 bottles of wine while cleaning up that night, and will enjoy trying out all of the gifts. 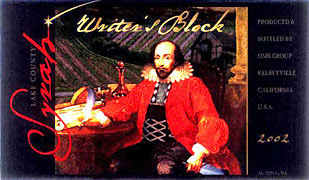 My friend Steve and his wife Amy brought a bottle of "Writers Block". What a great name for a wine, but there are SO many Australian wines with clever names. Lo and behold, it AIN'T Australian! It is a California wine....I had to try it. Without knowing the label or cost of this wine, I was able to give this a somewhat objective tasting. It had a nice color, although not super dark like many highly extracted Zins. This is mainly because it is NOT straight Zin. It is a blend of Zinfandel, Syrah and Cabernet Franc. In my mind...a wonderful blend. Red Raspberry, Cherry and Chocolate on the nose. The body is light for a Zin and a tad sweet...but the Berry, Blackberry Jam Pepper and Baking Spices really provide a nice tasting experience. I guessed this to be a $20 wine. I would have been dissapointed if it were more...but worth the $20. When I researched the wine and found it at $14.99 I knew I would be writing about it today. A nice bargain, a cool and hip bottle, and a great wine to surprise your friends. Thanks to the Stern's for bringing this nice wine to our attention. I always bring a good bottle of wine to any social gathering, especially around the holidays. Most of the time, it is a bottle of wine from my cellar, that has been aged at least a few years. I learned a long time ago that wines need some time to allow their flavors to consolidate, the tannins to soften. This time in the cellar changes the wind considerably. It softens the tannins, and for my palate, makes the wine more enjoyable to drink. While we are drinking the wine, I am often told the wine is fabulous....where can they buy some now? The disappointment is immediate when I tell them the wine for that particular vintage is no longer available. Today's selection comes from Jon Genderson at Schneider's Wine in Washington DC. He is clearing his warehouse, and has many wonderful wines on sale. This particular wine is a 1999 Shiraz from Barossa in South Australia. It has been in the warehouse for 6 years, and is fully mature. This wine was originally $50 when released, and the recent 2004 vintage was released at $80 per bottle. To be able to buy this 93 point wine at less then $40 is downright fantastic. The wine is opaque purple and highly aromatic. Blackberries, cassis, blue fruit and pepper blend beautifully. Wonderful fruit on the front and finishes with a bit of pepper on the finish....Soft tannin...almost non-existent....easy to drink....This is why you lay wine down. The results are beautiful, and the opportunity to pick some up at this price is rare. This still has great balance, good structure and should last for another 5-6 years in the cellar.....why wait?